One Delightful Day | Follow the creation of Tyson Vick's artwork, costuming and photography. My free online book A Steampunk Guide to Hunting Monsters continues, and you can read Chapter 8. A Blob on a Boat for free online by clicking on the link or picture below. Philomena must lure the ever growing blob away from the destruction of the ship and save the monster hunting tour from sinking to the bottom of the sea. What’s worse, her only remaining wool skirt is in danger of being destroyed by the rising waters! With the help of handsome thief-turned-sailor, Cyprien, can she survive the trials of dealing with A Blob on a Boat? Heroine Philomena from A Steampunk Guide to Hunting Monsters. 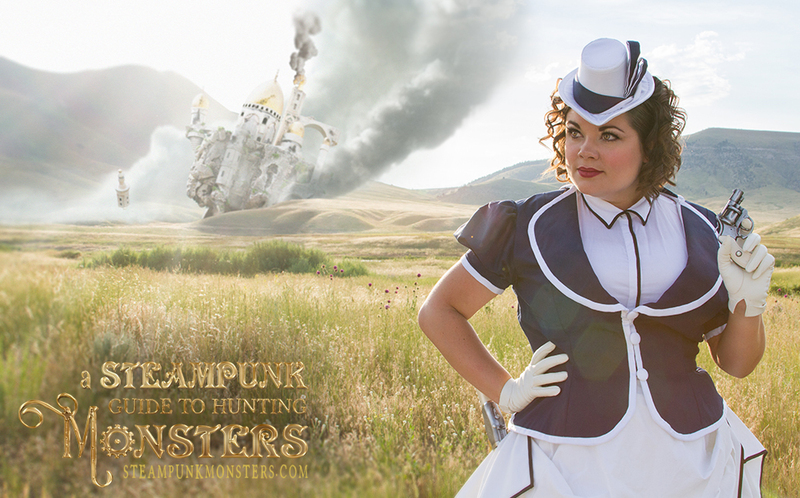 The Sailor and Philomena from A Steampunk Guide to Hunting Monsters. Brunhilde Bamfield from A Steampunk Guide to Hunting Monsters. My free online book A Steampunk Guide to Hunting Monsters continues, and you can read Chapter 6. The Dreaded Locomotive of the Living Dead for free online by clicking on the link or picture below. Philomena embarks on a death train to attend the funeral of one of the members of the tour. However, when she and fellow monster hunter, Missus Mister, discover the dead are coming back to life as zombies, the train ride becomes a fight for survival as well one for propriety. Can the monster hunting tour survive The Dreaded Locomotive of the Living Dead? The bokor and zombies from A Steampunk Guide to Hunting Monsters. Zombie attack from A Steampunk Guide to Hunting Monsters. The death train from A Steampunk Guide to Hunting Monsters. My free online book A Steampunk Guide to Hunting Monsters continues, and you can read Chapter 5. Automatons on an Airship for free online by clicking on the link or picture below. Airship from A Steampunk Guide to Hunting Monsters. Robot service from A Steampunk Guide to Hunting Monsters. The heroes carry an automaton head from A Steampunk Guide to Hunting Monsters. My free online book A Steampunk Guide to Hunting Monsters continues, and you can read Chapter 4. The Journey of the Genie for free online by clicking on the link or picture below. Read Chapter four, The Journey of the Genie. While in Turkey, Philomena Dashwood witnesses the theft of the only known Genie in captivity from its display. She is caught up in a wild adventure when the handsome thief starts making frivolous wishes and causes an entire palace to be ripped from the ground and carried through the clouds. The cruel Genie plots to throw the castle from the sky and kill everyone within. Will Philomena get a cup of tea before being expected to stop the carnage awaiting her at the end of the Journey of the Genie? 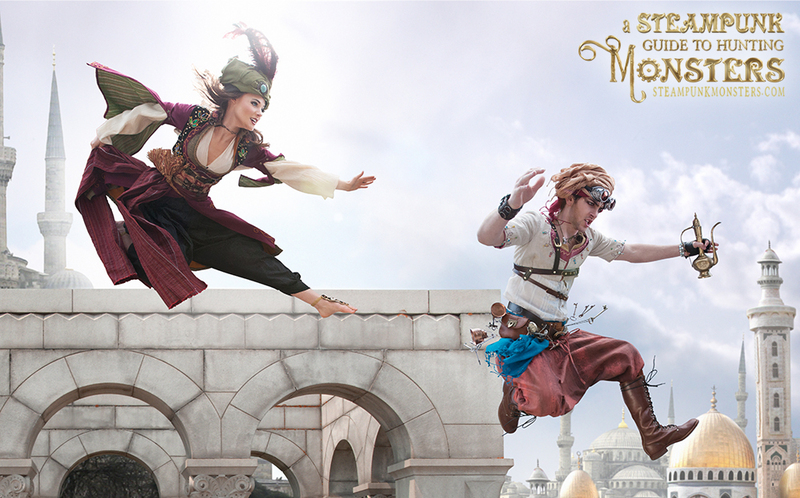 Philomena chases the thief who steals the genie. If you travel over to my steampunk site you can read about how I made the costumes and see behind the scenes photos. 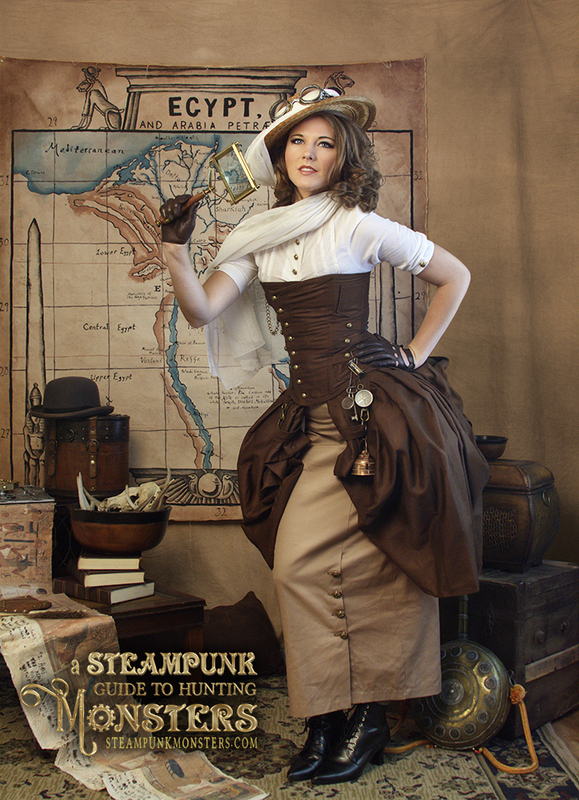 There are all sorts of costumes and steampunk props and devices in the pages of the book. Brin Merkley and Jeremy Fornier Hanlon portray the heroes of A Steampunk Guide to Hunting Monsters. View all the beautiful images and read the hilarious text here. 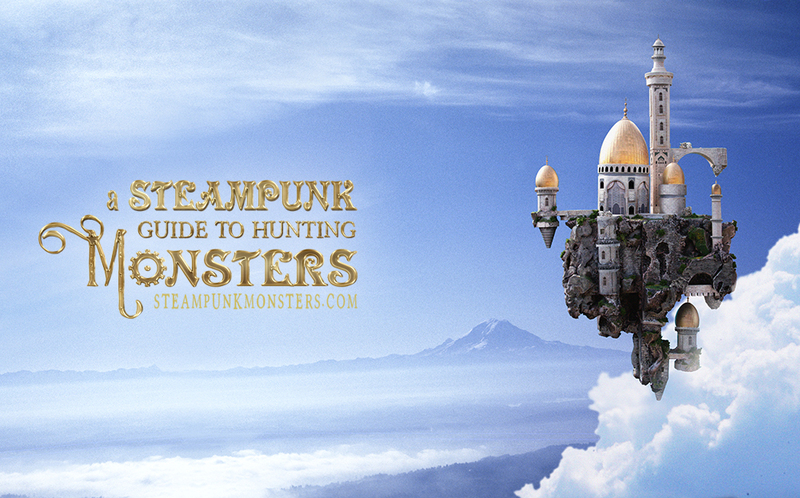 The Genie steals the castle in A Steampunk Guide to Hunting Monsters. 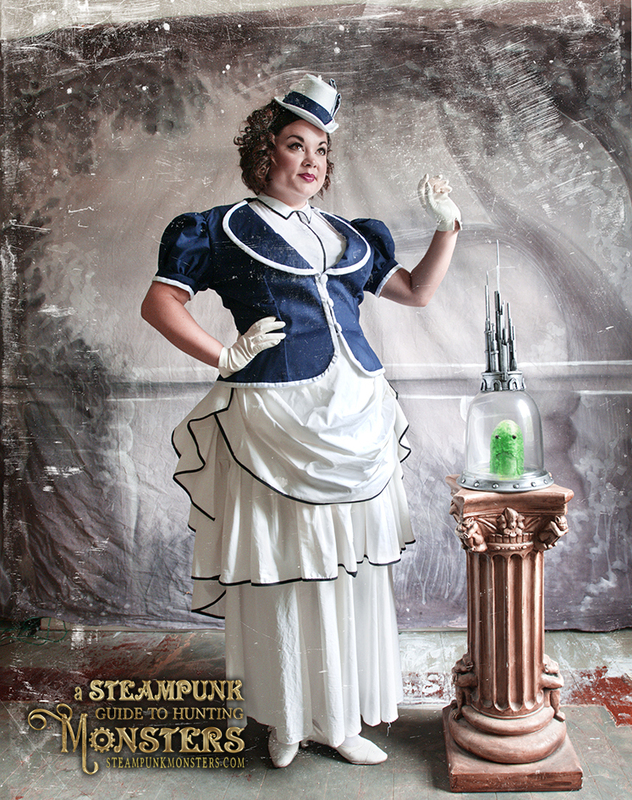 Lizzie plays Brunhilde Bamfield in A Steampunk Guide to Hunting Monsters. My free online book A Steampunk Guide to Hunting Monsters continues, and you can read Chapter 3. A Mechanical Mummy for free online by clicking on the link or picture below. During her trip to Egypt, Philomena Dashwood thinks she may have found a handsome suitor worthy of her attentions, but his attentions are obsessively directed toward reviving a cursed mummy. When the ancient monster is ressurected, it will stop at nothing to replace its own vital organs with the body parts of living humans! Can Philomena balance her burgeoning attraction to Lord Hargrave while also battling A Mechanical Mummy? 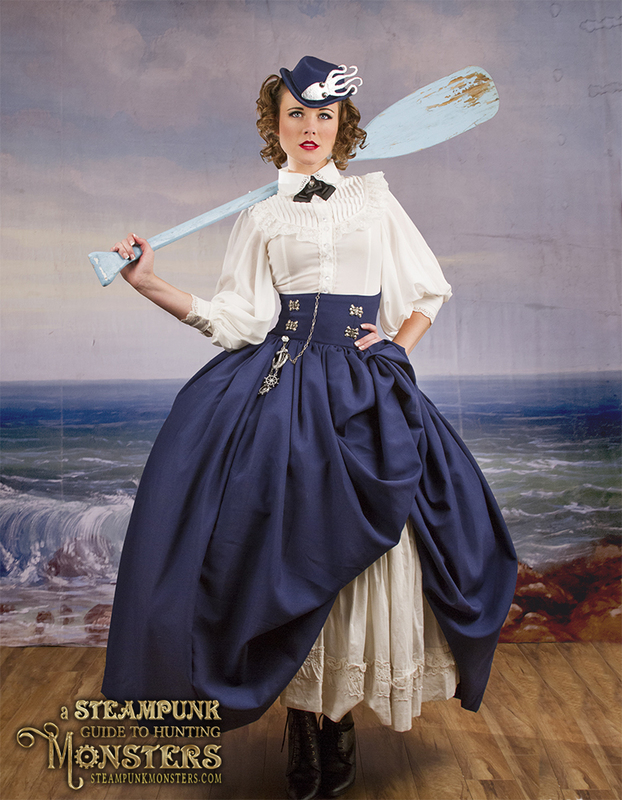 Brin Merkley portrays Philomena Dashwood in A Steampupnk guide to hunting monsters. 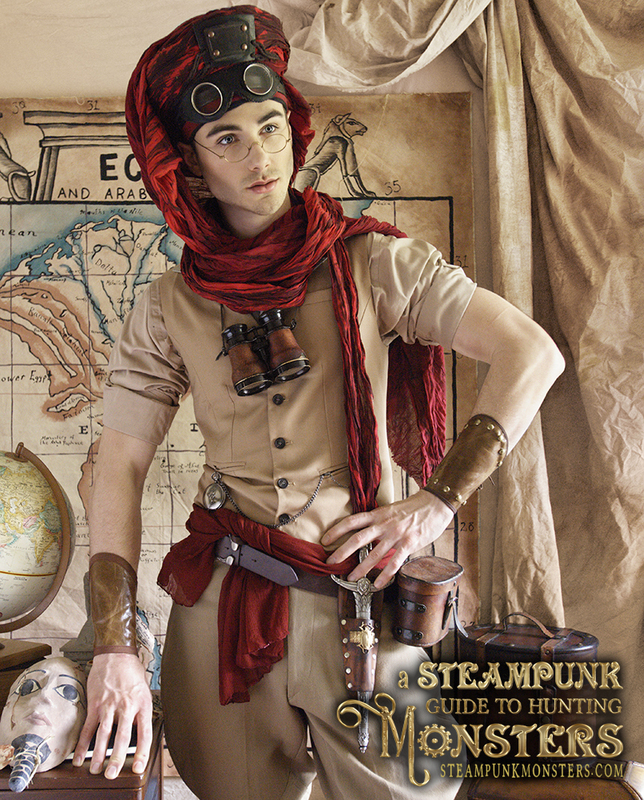 Mark Austin portrays Hargrave in A Steampunk Guide to Hunting Monsters. Read the chapter for free online here! 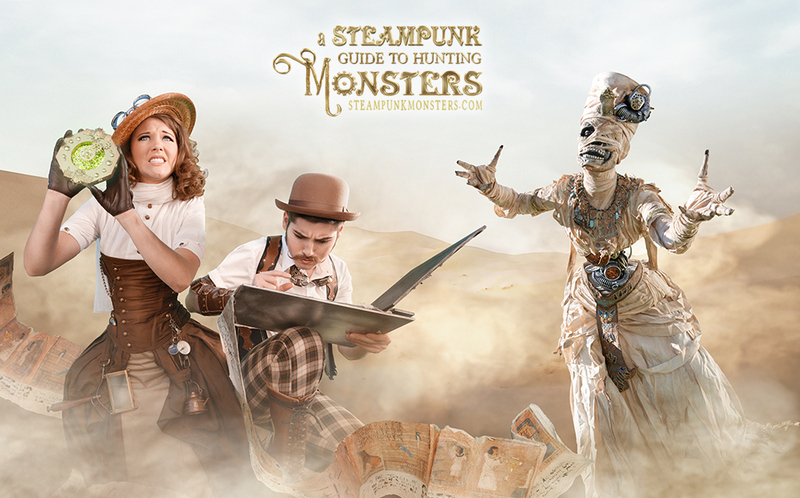 The heroes of A Steampunk Guide to Hunting Monsters fight a mummy!